Purchase min of RM40 (including any participating brands) from any Guardian stores. Proof of purchase (POP) must be kept for verification later. Type ‘Guardian Win a House Contest’ in the Guardian Malaysia LINE CHAT window to receive the contest form. Fill in details & answer the question follow by your full name, NRIC number, email address, contact number, purchase amount and Guardian purchase receipt number or tax invoice number. Log on to the contest website www.guardian.com.my/winahouse and key in full name, IC number, contact number, email address, and purchase receipt number in the given space. Contest forms will be given to customers after purchase. Staple the receipt to the contest form and submit it into the box placed on top of the cashier counter. 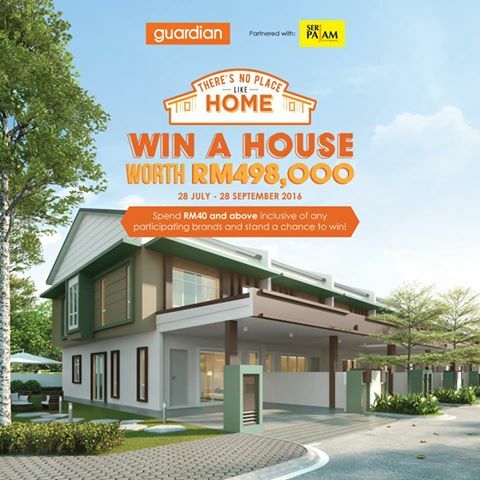 Visit Guardian Malaysia Win A House Contest for more details.